16 ounce Sweet & Mild Hungarian Pepper Relish is our sweet relish mixed with Hot and Mild Hungarian Banana Peppers and Red Bell Peppers. Great for Brats, burgers, hot dogs, or even as a way to give your salads an extra zest! From John of Atlanta, Indiana on 8/14/2018 . In my opinion, there just isn't anything better to put on a brat or hot dog than this! From Cynthia Sharpe of High Point, North Carolina on 7/11/2018 . From Ellen of Louisville, Kentucky on 6/23/2018 . mix with mayo for terrific egg salad; thousand Island dressing; etc. It's unusual and wonderful = with a slight kick to it. From Larry Marsh of Greenwood, Indiana on 5/10/2018 . 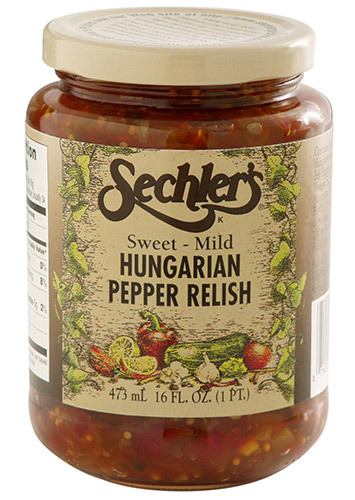 We like Hungarian pepper relish to put on hot dogs better than pickle relish. From Don R of Grand Rapids, Michigan on 9/24/2017 .